What is the economics behind this? Tax cuts increase disposable income and so will increase consumer spending and aggregate demand. Higher demand will lead to increased economic growth, at least in the short-term. Tax cuts boost aggregate demand, leading to higher real GDP. Tax cuts for business increase their retained profit and will enable more investment. This investment will increase both aggregate demand and, in the long-term, supply-side capacity. Income tax cuts will encourage people to work more, increase productivity and increase economic growth rates. This analysis is based partly on the Laffer Curve analysis – which suggests tax cuts can actually increase tax revenue because, with lower tax rates, people will work more leading to more tax revenue. Lower corporation tax rates may encourage more US firms to keep taxable revenue in US, rather than use offshore subsidiaries, e.g. Ireland, Luxembourg, The Bahamas. In this way, corporation tax revenue could increase. As the US economy is already growing by 2.5-3%, there is limited spare capacity, increasing consumer spending and aggregate demand may come up against supply constraints. 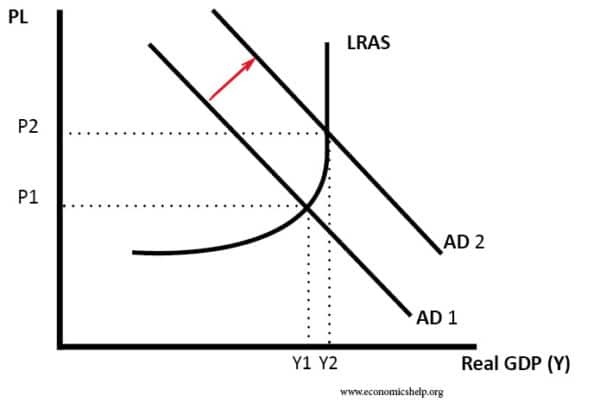 If the aggregate demand does rise and short-term growth picks up – it is likely to cause an uptick in inflation. If inflation rises, the Federal Reserve is likely to raise interest rates – to keep inflation on target. Therefore, the expansionary effect of tax cuts will be offset by tighter monetary policy. Firms are unlikely to increase investment as a result of tax cuts. Corporations already have high levels of retained profit and savings. Corporation tax cuts may encourage some investment, but tax rates are not the major determiner of business investment. The supply-side benefits of income tax cuts are likely to be very limited. Laffer curve analysis works when tax rates are very high 80-90%. But, the proposal is to cut the top rate of income tax from 39.6 percent to 35%. Tax rates are already relatively low. It is not the case millions of US workers are being idle waiting for tax rates to be cut to 35%. There is also an income and substitution effect of tax cuts – which means the effect on labour supply is uncertain. The US long-run productivity growth is driven by labour productivity, technological growth, innovation – not tax rates.